The jacketed soft point bullet (JSP) was designed to fill a certain niche. Where a hollow point doesn’t offer enough penetration and a full metal jacket simply doesn’t offer enough expansion – the JSP fills this role perfectly, offering a moderate level of both. Jacketed soft points come in a very large variety, but are most commonly marketed as hunting rounds, and are more common for rifles than pistols. Since some areas do not allow hollow points, the JSP can be used for hunting, defense or other areas where hollow points are the bullet of choice, but are banned or restricted. You can tell you have a JSP simply by looking at the bullet. The bullet is jacketed at the 1/2 or 1/3 mark, leaving an exposed lead (or other material) nose. These can come in many types, even in a hollow point round, which is bizarre since JSP rounds tend to be considered an alternative to HP rounds. They come in flat nose, round nose, boat tail and every other variety you can imagine. Some have polymer tips and others are simply lead. These rounds perform very much the same as a non-jacketed bullet in regards to ballistics and accuracy. However, performance on the range is very dependent on the shooter. It should also be noted that different manufacturers and lines of JSP ammo have many different unique features specific to only those proprietary rounds. The biggest advantages of using JSP ammo over round nose or FMJ ammo is the expansion. 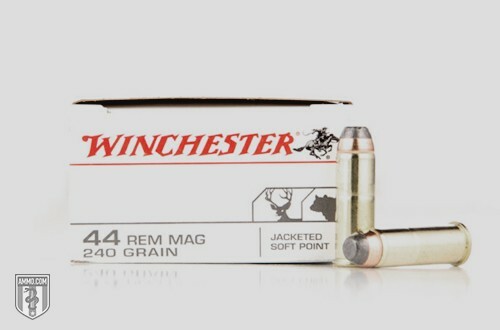 It’s a definite advantage for this ammo type if you happen to live in one of the regions where hollow points are banned or to make sure you are using bullets that will provide a quick, clean kill. Another advantage is that the blunted nose will help reduce the likelihood of primer detonation in rifles with tube magazines. There are several different calibers that are made with these bullets like .44 Magnum JSP, .357 Magnum JSP and 9mm JSP. As this tends to be more of an in-between type of ammo, you won’t get the same expansion as a traditional hollow point, which can be an issue for some uses. Luckily most manufacturers offer their own special lines of JSP ammo, and this can take care of that problem. You can still find hunting, target shooting or defense ammo in JSP with unique features such as a boat tail or polymer tip. Overall this is a good ammo choice for someone looking for the power of a hollow point with more penetration. And it may be the best option if hollow points aren’t allowed. You will often find these with lead noses, but if you check around, you can find some great substitutes that aren’t as restricted.